On Sunday night we wanted to go exotic, so I proposed to visit Thailand restaurant in Belair. 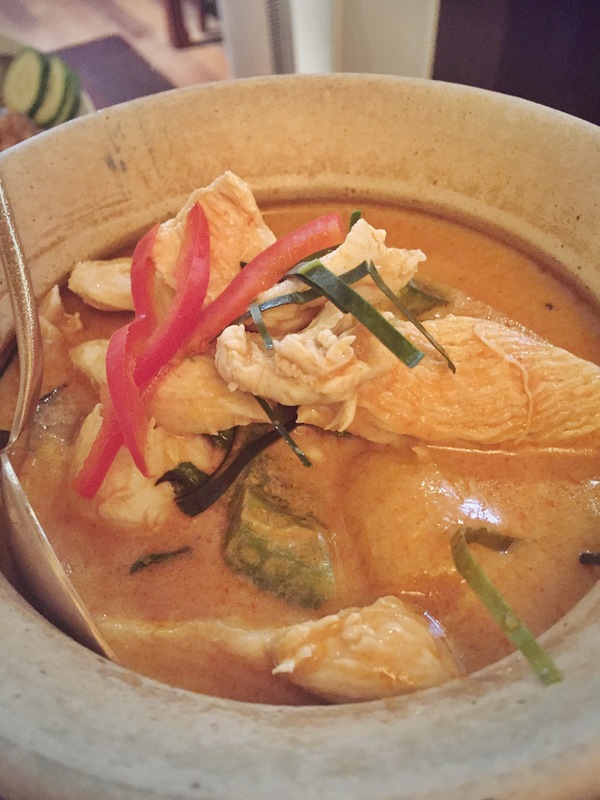 Since I have been in Bangkok recently, I am more and more fascinated by Thai kitchen, but examples I have tried in Luxembourg so far did not satisfied my expectations – and I still prefer cook it at home by myself. I have been to Thailand restaurant last time about five years ago and my memories were mainly related to an overpriced bill and a very rude service. We got to the restaurant at 7.30 pm, without a reservation, and we were accommodated to a small table on side of the corridor between the two main rooms. I was very fascinated by the internal décor of the restaurant, exotic but not cheesy, almost a bit sophisticated. We were handle the menus and, after sometimes, asked for an aperitif. 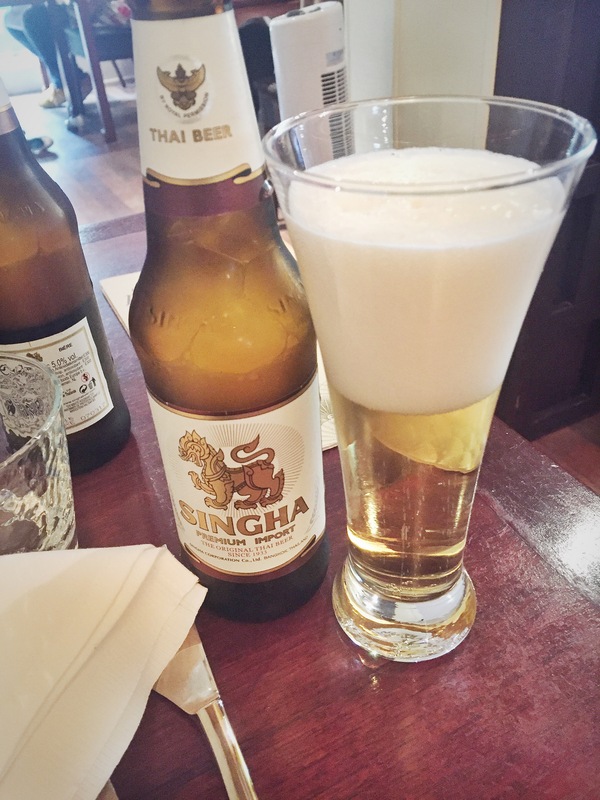 We took two Thai beers and shortly after received also some shrimp chips. The restaurant got packed soon. 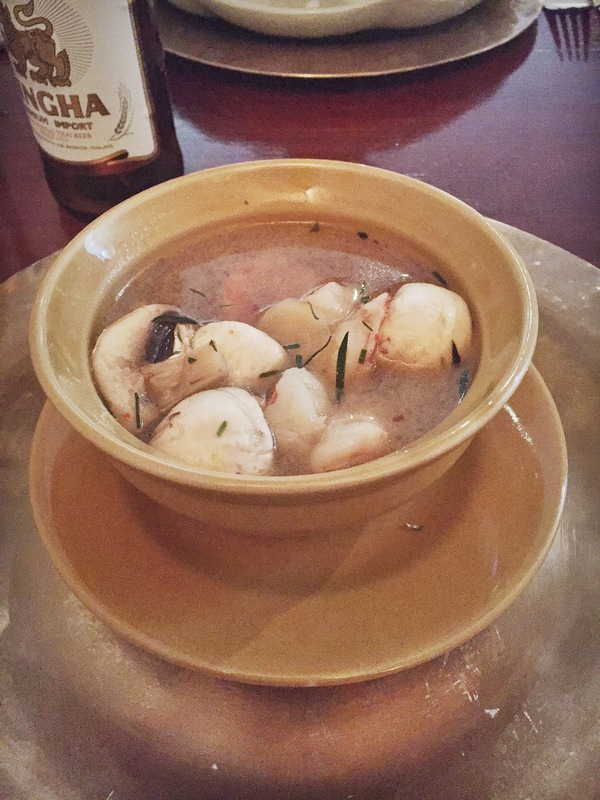 I had a soup with mushrooms and shrimps as starter, while hubby had a cold beef salad. For main, I went for Curry Basil Chicken, he had some spicy beef with garlic and we shared a Pad Thai (noodles), as side dish. We concluded with a fried ice cream to share. Enjoy the pictures and then discover my option about the restaurant. I enjoyed the food: the soup was delicious and the curry nice. 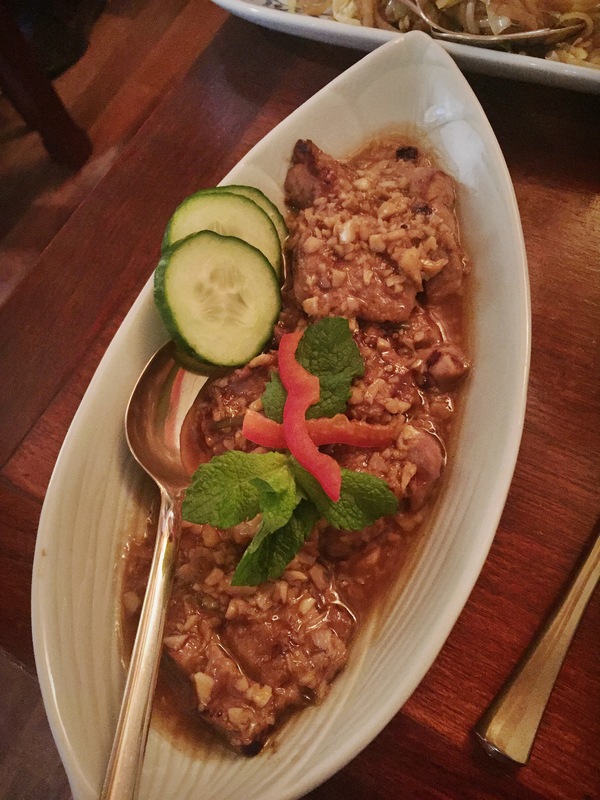 I definitely prefer it a bit less tick but it was tasty and both were kind of authentic for my Thai experience. 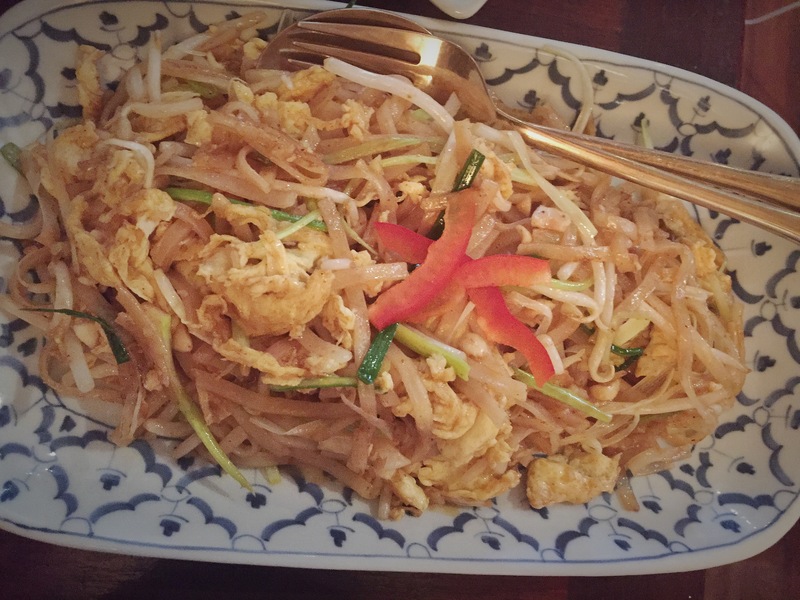 Only the pad thai to me was not exceptional (cracked noodles, too much egg), but hubby enjoyed it, as well as his dishes – not my kind of, but I tried them and they were spicy and well-cooked. As said above, I really like the ambience and its details. Our table was an unfortunate one, but should you reserve, just ask to be in the back room next to the window. I still find it a bit overpriced, like five years ago. Prices for main dishes are fine (around 23 euro for a meat dish), but I definitely find too much 16 euro for my tiny soup and 16 euro for the pad thai as side dish. We ended up spending 130 euro in total, hubby had half a bottle red one and I had water with the main, so, on the pricey side. Service could really be better. Waiters are very stressed, running around and not even taking care about “did you like the food” – above all in consideration of the price as per above. My husband was trying the wine and the waiter was pretty annoyed waiting for him doing it, looking around and acting very fast. The thing that really spoiled our dinner was at the very end: hubby found a hair in his ice-cream half, he left it on the dish and he politely noted it to the waiter when he came to remove the dishes from the table. To me, it would have been a nice gesture to remove the ice-cream from the bill – but it was not done. In conclusion: I quite enjoyed my dinner at Thailand and liked the food and the ambience. I find anyway the service should really improve to match the price target of the restaurant, that is a bit too high. Not sure I will feel coming back very soon. Suggested for an unusual romantic nigh out. Thailand and Thai Celadon have the same owners/managers, so it’s not surprising why both are pricey. 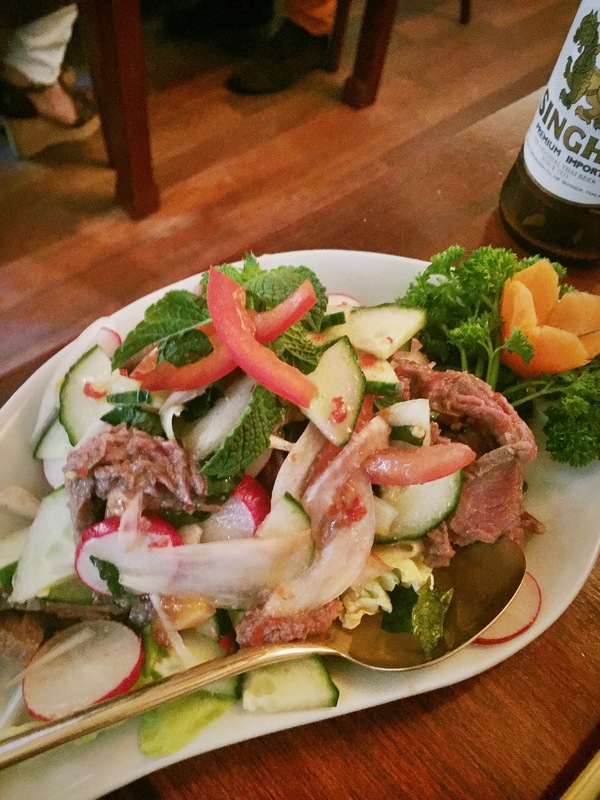 I have only eaten at Thailand once (maybe seven years ago) and I remember it as an okay experience.